According to the reported verdict, the plaintiff claimed that her last settlement offer prior to trial was $2.5 Million. Defense counsel claimed that it was $6 Million. Ultimately, the jury awarded an even $1 Million and the plaintiff was able to obtain an additional $25,000 in “awardable costs” with a post trial motion. My Analysis of this Verdict As A California Wrongful Death Lawyer: Damages in a wrongful death claim based upon the state of the law in CA are very difficult to place a dollar figure on and even more difficult to argue to a jury! This would be my main take on this verdict. Telling a jury, on the one hand, that they are to award money based upon such general concepts as the “loss of love, society and companionship” on the one hand but, that they should not consider “grief” or “mental anguish” on the other hand gives a jury a very vague notion of how to calculate such damages. In my opinion, this leads to a lot of verdicts where: (1) a nice round number is awarded; and (2) the number is based upon underlying jury bias or notions of what is “enough” and what is “too much”. In this case, the barrier was hit, in my opinion, at seven figures (i.e. one millions dollars). The plaintiff, through their attorney, clearly argued that a life lost was worth more than this amount but, the defense clearly argued to limit the damages to this barrier amount or less. Having done a jury trial in Kern County, I know that the jury pool is conservative. Kern County is a fairly rural county with the economics based heavily on agriculture and oil and gas production. 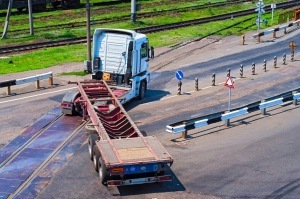 There are a lot of truck accidents and, unfortunately, people are struck and killed or seriously by tractor trailers hauling produce and other goods many times a year. I applaud the efforts of plaintiff’s counsel in this case to put on the testimony of the decedent’s mother as to what the loss of her son meant to her and to argue to the jury that this should have significant value. The ultimate question is very difficult to answer, though: What is the value of one human life!